"Dreams I'll Never See" / "The Creeper"
Molly Hatchet is the self-titled debut album by American southern rock band Molly Hatchet, released in 1978 (see 1978 in music). The cover is a painting by Frank Frazetta entitled "The Death Dealer". Starting off both the album itself and the recording career of the band, the first song famously begins with lead singer Danny Joe Brown growling "Hell yeah!" "Dreams I'll Never See" is a cover of The Allman Brothers Band's song "Dreams" from their debut album, via Buddy Miles's reworking of the song from Them Changes (1970). ^ Smith, Michael B. 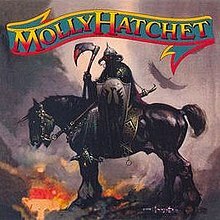 "Molly Hatchet Molly Hatchet review". AllMusic. Rovi Corporation. Retrieved 2 July 2011. ^ Popoff, Martin (October 2003). The Collector's Guide to Heavy Metal: Volume 1: The Seventies. Burlington, Ontario, Canada: Collector's Guide Publishing. p. 186. ISBN 978-1894959025. ^ Bob Lefsetz. "Welcome To My World - "Buddy Miles"". Rhino.com. Retrieved 30 August 2018. ^ "Molly Hatchet Awards". AllMusic. Rovi Corporation. Archived from the original on 7 April 2016. Retrieved 20 January 2017. ^ "RIAA Database: Search for Molly Hatchet". Recording Industry Association of America. Retrieved 20 January 2017. This page was last edited on 17 December 2018, at 22:43 (UTC).